India’s luxury market bucked the lingering economic slowdown and swelled to $8.5 billion in 2013 as savvy consumers continued to open their purses on high-end products and services, below are the top 5 resorts in north India preferred by the elite travelers. A wilderness camp of 10 tents set on the edge of Rajasthan’s Ranthambore National Park, Aman-i-Khas combines Aman, the Sanskrit word for peace, with khas, meaning special in Hindi and Urdu. Surrounded by the starkly beautiful Aravalli Hills, the camp provides access to the wildlife of Ranthambore National Park which measures a total of 1,334 square kilometres. Guests of Aman-i-Khas can also explore the region’s ancient forts and colorful rural villages nearby. Open from October through April each year, the best season for wildlife spotting, Aman-i-Khas is a wilderness camp located in a rugged brushwood forest on the fringes of Ranthambore National Park. 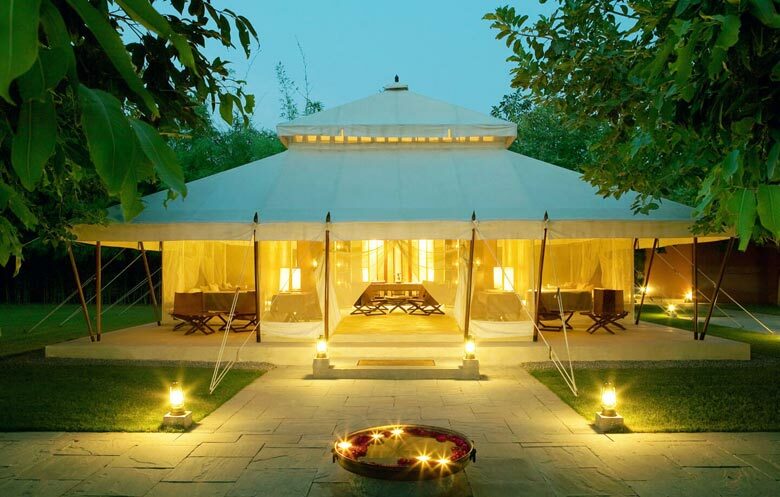 Aman-i-Khas offers accommodation in 10 luxury air-conditioned tents each with soaring canopies draped in the Moghul style. There are also three separate tents for dining, spa treatments and relaxing. Twice-daily, guided wildlife viewing excursions take guests into the park to spot indigenous game including Tigers, Leopards, Hyenas, Sloth Bears, Crocodiles and Chital Deer. Not much is needed to be said about a hotel that offers direct views of the Taj Mahal from practically every window and even some bathrooms. 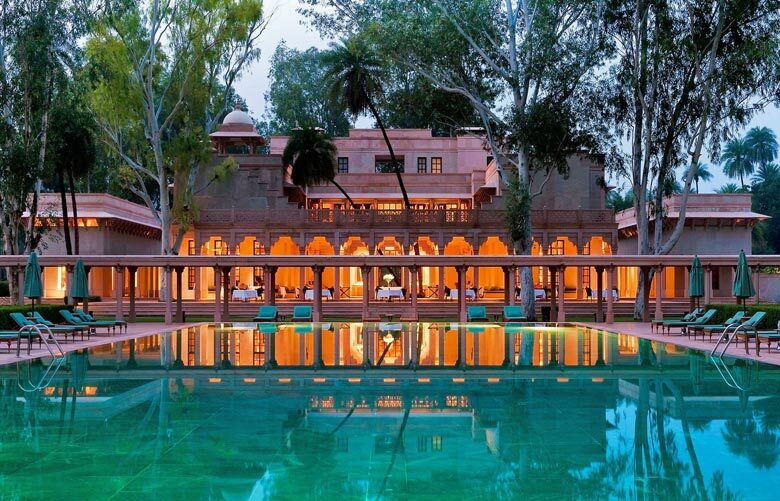 Based on Moorish and Mughal architecture, this lavish property features fountains, reflection pools, terraced lawns and pavilions with spectacular interiors. The rooms itself are decorated in rich shades of purple, oranges and yellows and the marble bathrooms with their grand soaking tubs are regal. Ranked amongst the leading resorts in the world, The Oberoi Amarvilas offers the best view of the Taj Mahal in Agra. The hotel is located 600 meters from the Taj Mahal and all rooms, suites, lobby, bar and lounge offer breathtaking views of the monument. 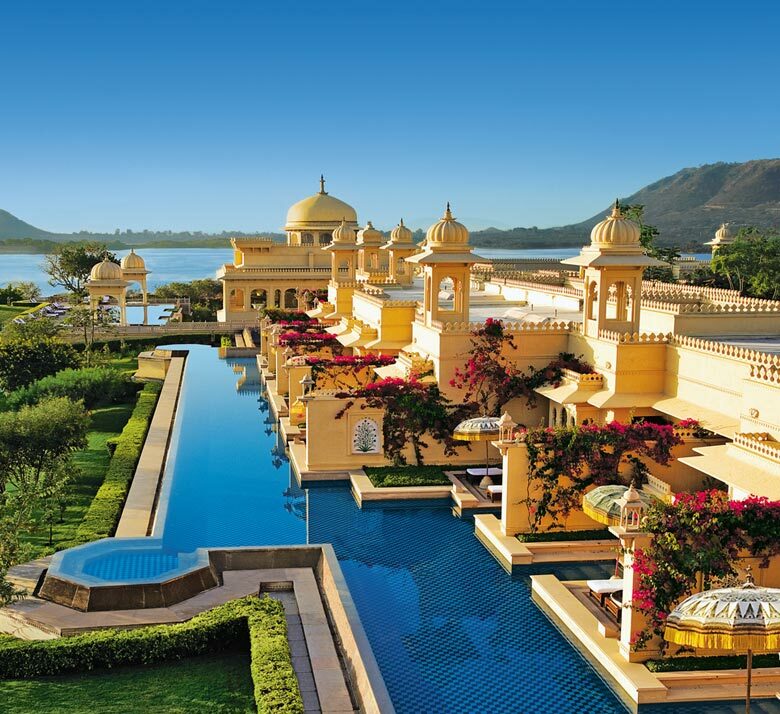 Located in “The Pink City”, The Oberoi Rajvilas is ranked the third best in Asia and the eighth best hotel in the world. This palace hotel is known for its variety in accommodation which range from luxury rooms and tents to villas, all with four-poster beds and teak floors. With its Edwardian claw-foot tubs and embroidered interior canopies, it is a perfect mixture of an ancient Rajasthani fort with contemporary Italian designs. All this is set in 32 acres of ground about 5 miles outside Jaipur. All the rooms come with the following features: LED TV, DVD & CD player, satellite television, wired broadband internet access & Wi-fi, separate walk-in closet, electronic safe, direct dial telephone, personal mini-bar, tea coffee making facility, 24-hours butler service. Known as one of the world’s best resorts, Amanbagh is a green paradise among the sandy plains and rocky topography of Rajasthan. Amanbagh means “A garden of peace” and it truly lives up to its name. With its lovely palm and frangipani trees and vegetation, it is hard to imagine a more serene place. This modern day ‘Mughal Palace’ used to be the former spot of the Maharajah of Alwar’s hunting lodge and personal pleasure garden. Its rooms are one of the largest in the country. In the countryside surrounding Amanbagh there lies evidence of a lost empire whose historical ambition still echoes in the remains of grand architectural ruins. Excursions on a cultural trail within a 30km radius of Amanbagh include visits to the nearby Ajabgarh Fort and Temple which were built in 1635 and are connected by an underground passageway. Nearby, the Baba Kapoor Shah Mosque was erected in the 17th century in memory of the great Sufi mystic, Baba Kapoor Shah. Bhangarh, built in the mid-1600s, is 15km from Amanbagh and is of great archaeological importance. It is a national heritage site comprising an entire city of bazaars, palaces, gardens, temples and bathing pools deserted overnight by inhabitants who feared a curse. Ananda in the Himalayas is a luxury destination spa in Narendra Nagar, Uttarakhand, set in the Indian Himalayas. Nestled on a 100-acre , Himalayan mountain estate set amidst sal forests, overlooking the river Ganges, close to the towns of Rishikesh and Haridwar, and is India’s first destination spa. Ananda focuses on Yoga and Ayurvedic practices, combined with international spa therapies. The property includes the royal palace of Narendra Nagar, of the Maharaja of Tehri Garhwal (an Indian princely state), and the restored Viceregal Palace which was added to the palace in 1910 – 11 by the Maharaja for an expected visit of the Viceroy of India. Though the visit never materialized, the edifice remains, and went to accommodate the likes of Lord Mountbatten of Burma, a later Viceroy of India. Ananda in the Himalayas is considered one of the best spas in the world by the The Telegraph and rated No. 1 destination spa in the world by Travel + Leisure magazine. For more information on North India tour packages, contact the leading travel agent in Delhi, India – Swan Tours.